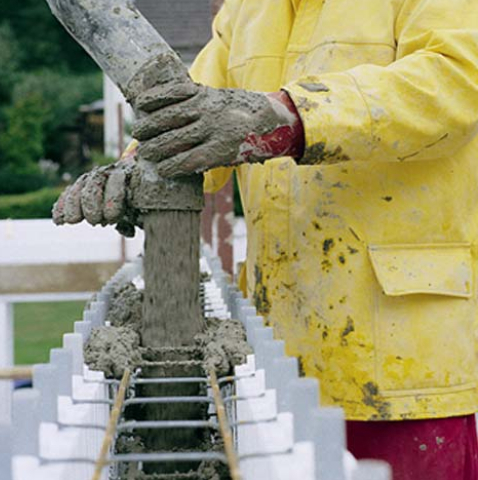 Rhodipor Ecobuild Insulated Concrete Form provides you with the complete kit needed to deliver your building needs. 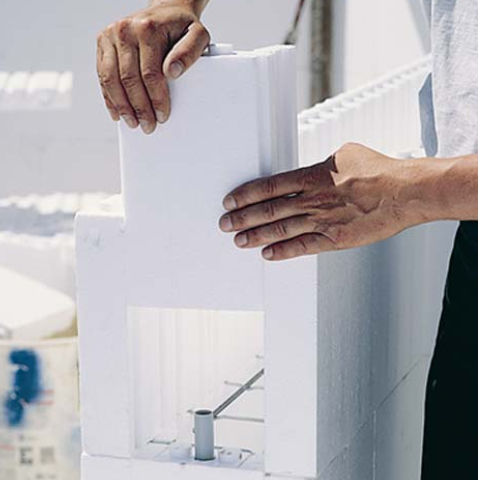 Set out below is a step by step guide into how the Rhodipor Ecobuild ICF comes together, providing you with the opportunity to build fast without compromising on quality. 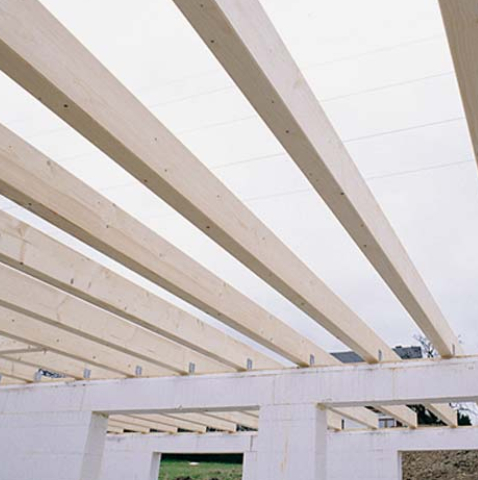 We suggest that as much of the Rhodipor Ecobuild ICF elements are placed on the floor in close proximity to the build as practically possible to minimise travel distances. This is generally on the structural floor which should be free from debris. All other elements should be stored in a location where they will not be damaged, or require multiple moves. 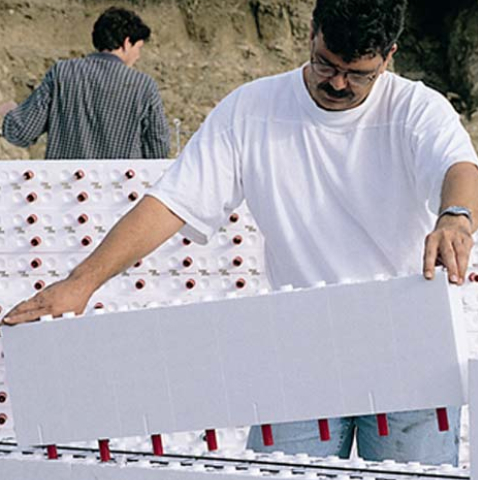 To begin construction the Rhodipor Ecobuild panel element is turned upside down. Foot connectors are then installed joining the inner and outer elements together. 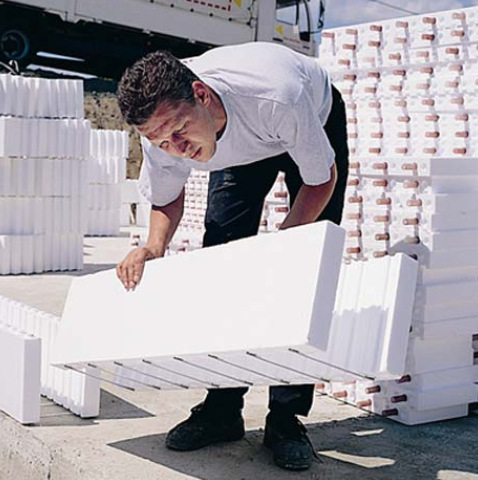 The product when returned the correct way up is positioned along the line of foundations. A maximum deviation along the prepared surface of +/- 5mm to 10mm is generally accepted. 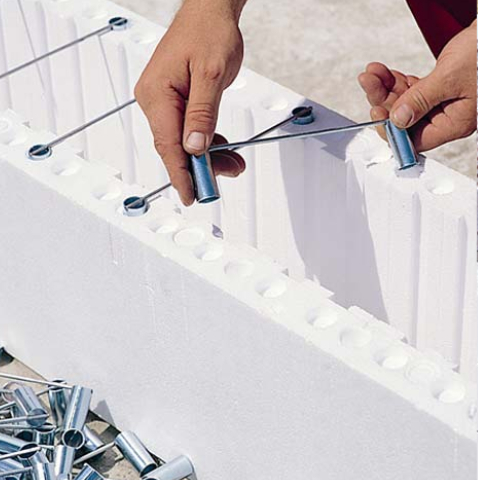 The foot connectors are applied to all elements and are the starting point of the entire build. 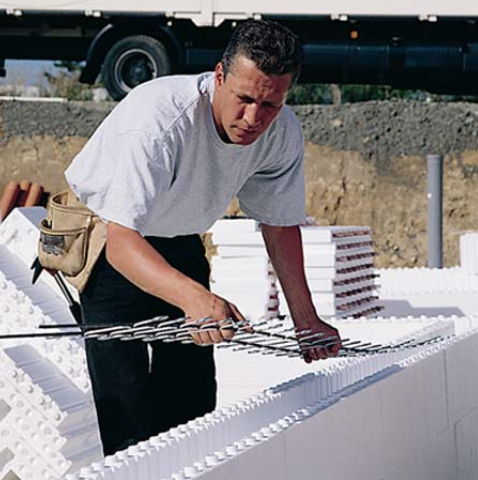 The concrete base for raft constructed foundations, or trench blocks for traditional strip foundations form the outline for the Rhodipor Ecobuild walling to be positioned. 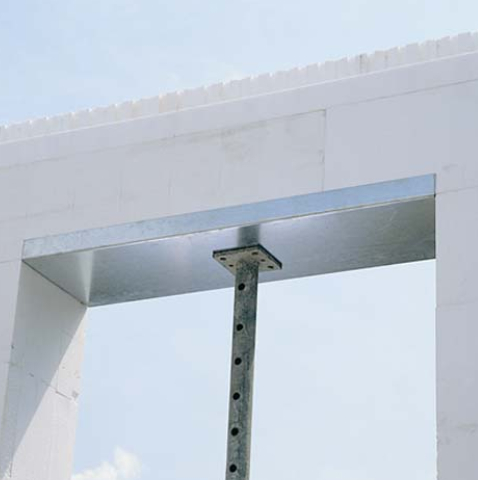 The patented steel bar is then put on the first layer to unify the inner and outer leaf of the system and to provide stability and straightness to the walling throughout the remaining build. 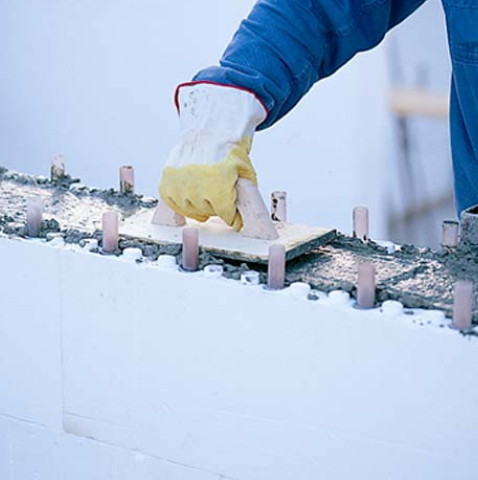 Once the concrete has been poured the steel remains encapsulated in the concrete acting as additional reinforcement. Element by element the wall is then increased in height, building walls in a system similar to that of Lego. 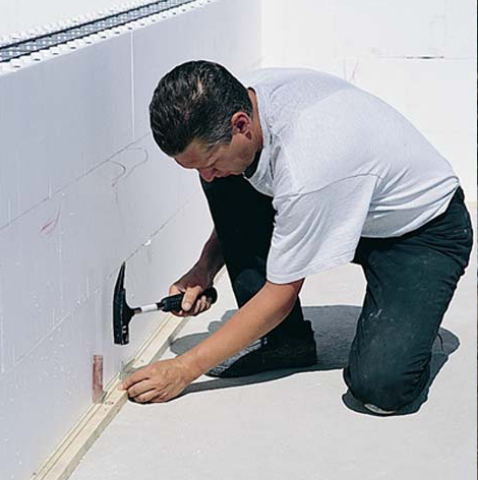 Elements are easily cut to size using a standard saw. With Rhodipor Ecobuild there is no need for a tape measure as each 1000mm long panel is subdivided in to 125mm identifiable modules. 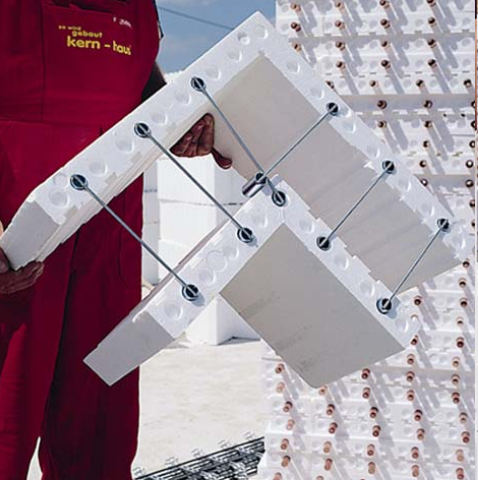 To ensure that walls are built efficiently the building should be set out to a 125mm module horizontally and 125-250mm vertically. Vertical sides to windows and doors are formed by adding preformed stoppers reducing the need for additional formwork but ensuring the reveal is insulated to the same standard as the external envelope. Unsightly soil pipes can be concealed within the walling to retain a cleaned lined aesthetic of the building. Once the third layer of Rhodipor Ecobuild has been installed all dimensions are checked including the square and verticality of the walling, the cavity is then part filled with concrete. Hand filling the forms with concrete at this stage ensures that the walls will not be knocked out of position. An alternative approach to this is to fix battens to the base which will then later be removed. 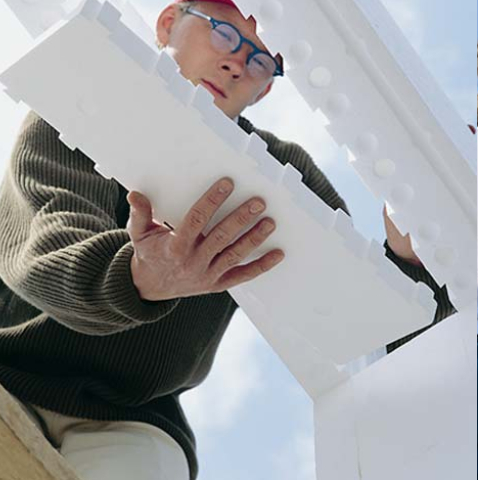 To continue assembling struts are used. Struts are fixed to the Rhodipor Ecobuild walling and structural floor on the inner side of the build and are positioned at distances between 1200mm and 1750mm. 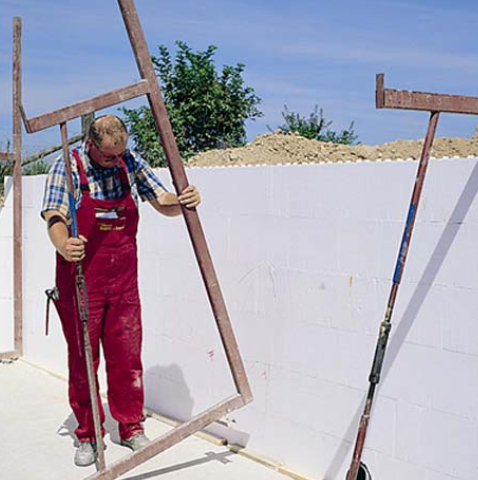 They allow minor adjustments ensuring the wall is maintained plumb whilst providing a working platform. After securing the struts an independent platform can be constructed over to allow work to progress at high level minimising scaffolding costs. 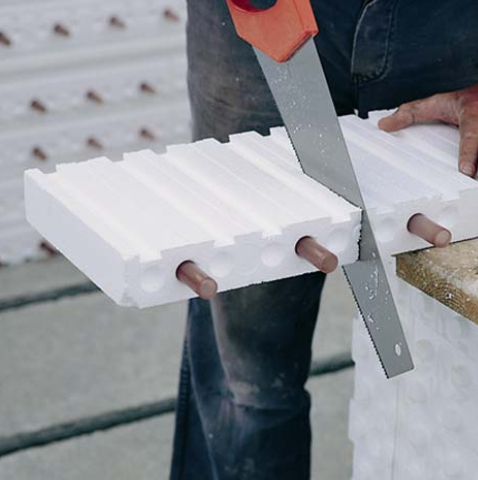 Lintels for windows are formed using the Rhodipor Ecobuild panel to the sides and then fitting a further purpose made lintel closer to the underside. 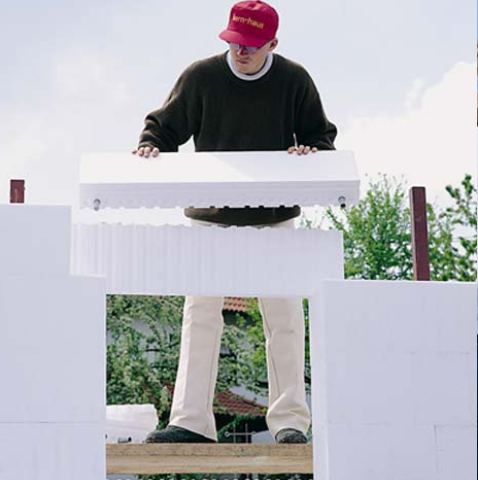 The lintel closer provides a formwork to the head of the window that remains in place minimising thermal bridging. 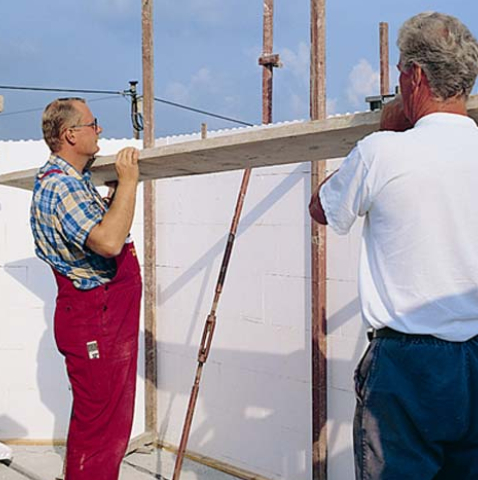 Prior to pouring the lintel is supported with strong boys for additional bracing. 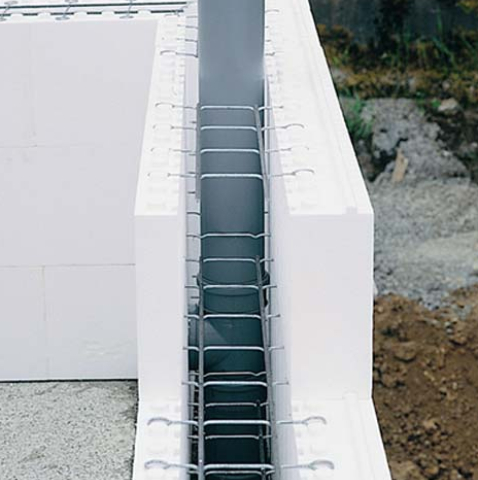 Prior to pouring we recommend that all penetrations through the Rhodipor Ecobuild panels are undertaken to save trades time in coring through the walls at a later date. 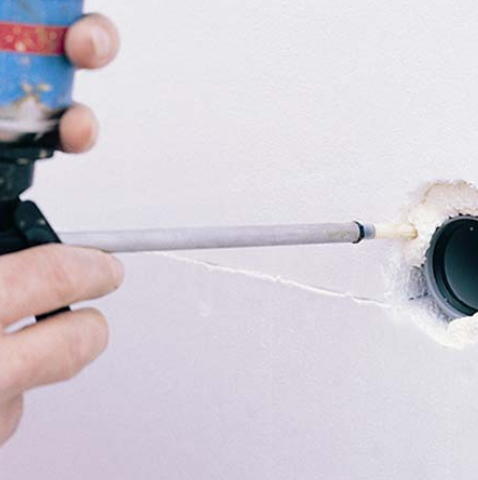 Penetrations should be sealed with spray foam to minimise concrete egress when pouring. Starting at the lower window cill levels and then moving up the building, concrete is delivered between the Rhodipor Ecobuild panels using a concrete pump. The pump ensures concrete is poured to locations in a controlled manner quickly and efficiently. The concrete is then floated off to provide a flat and level surface to receive the structural floors or wall plate for the roofing over. As soon as the concrete within the walling has set the laying of the floor can be commenced. 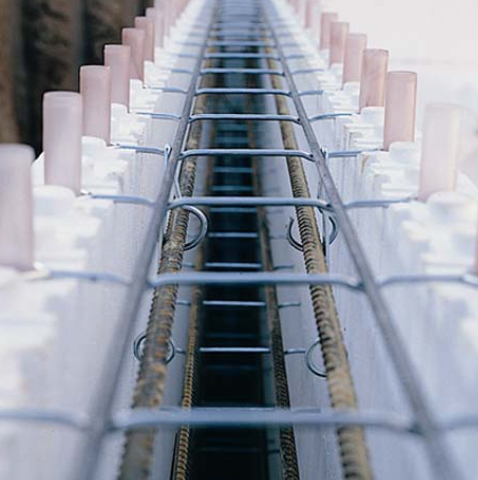 The concrete core is capable of receiving all floor types including TGI, beam and block, wide span precast floors and more. 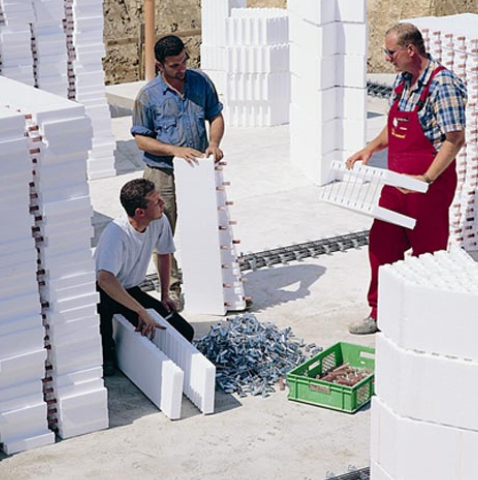 With the build quicker the floor can be installed sooner and the remaining walling can then be constructed. To continue the upper level walling the same method as previous detailed above is continued.